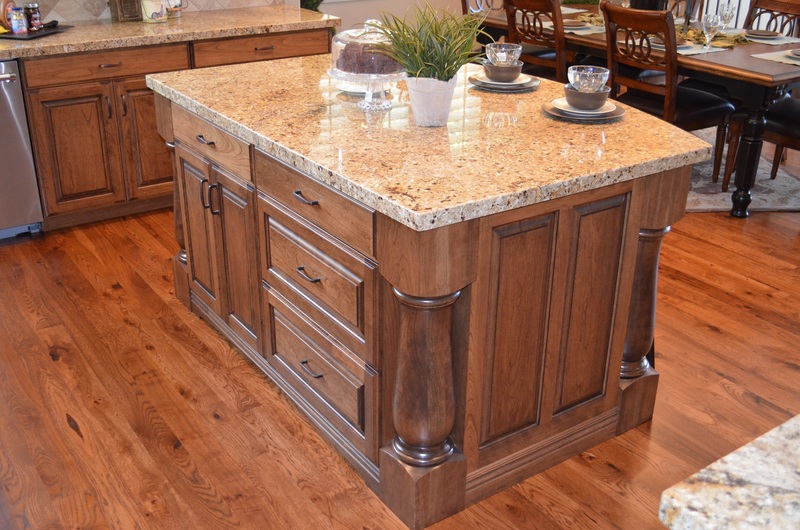 In a just-in-time world, Kitchen & Bath by CAM has been working on one job for three years. But it's a special job: making all the millwork and furniture for a Frank Lloyd Wright-designed house that had never built until now. The house is being built on an island in a lake in Putnam County, N.Y., and winter weather blocks construction much of the year. Brothers Chris and Mike Wilmot tackled the job after purchasing the assets of an architectural millwork company in Norwalk, Conn. The two brothers came from a commercial construction background. Chris says the company specializes in architectural millwork and cabinets, entertainment centers, wine racks, and takes special pride in its custom libraries. Their market is high-end residential, and they may do a kitchen for $30,000 to $75,000, including cabinets, inserts, mouldings and accessories, mostly in Fairfield County, Conn., and nearby New York City. A new reception area in their own building in Norwalk features ribbon-cut sapele, Crawford ceilings and pilasters. A kitchen showroom is planned. "Our customers aren't coming to us because we're cheap," Chris says. "They're coming because they know we do a quality product and we do it in a timely fashion." KBCAM does both new homes and renovation, and until recently has done work on a lot of large spec homes. They work with builders, but also like to make contact with the homeowner. 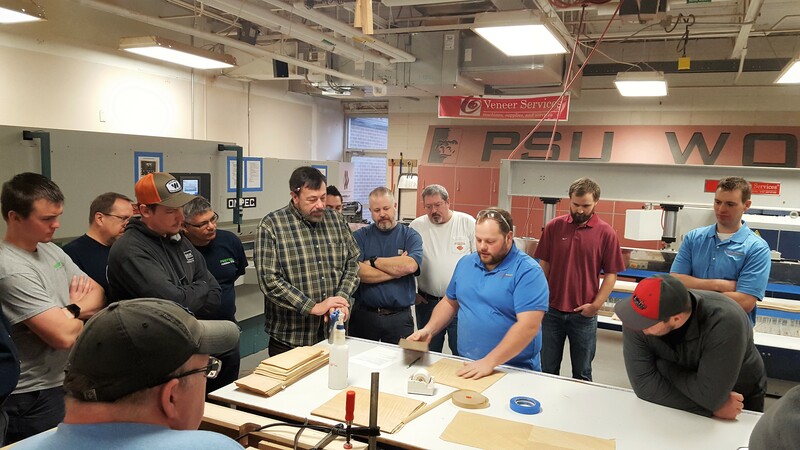 "It's ideal to get to the homeowner if possible, because they're the ones who are more interested in getting a better quality product," Mike says. "He liked what we proposed we could do," Chris says. "We did all 80 exterior windows and doors on the house, and all built-in cabinetry. We also did 50,000 board feet of interior and exterior v-groove planking for all the ceilings and walls. We fabricated every piece of wood in that house if it's a finished piece of millwork." In addition, the company produced replica Wright furniture, beds, nightstands and desks in the bedrooms, all of African mahogany. They also fabricated about 100 lineal feet of upholstered built-in benches that run along the perimeter of the living room, dining room and alcove. Construction on the island house has been going on for three years, and KBCAM has been working on it for more than two, completing the cabinetry during the past eight months. Chris and Mike looked at photos from the architect and books about Wright. "The biggest challenge was making everything functional with the quality we wanted, but also making it look like the Frank Lloyd Wright era," Chris says. "It all came from the architect. He had exclusive control on how it should look. All of our drawings were reviewed by him, marked up and submitted back to us for changes. There was a revision process before we put anything in production." For example, all the cabinet doors have piano hinges on them. All the grain is horizontal. Cabinets are frameless, with inset doors inside the cabinet box itself to provide very clean lines. 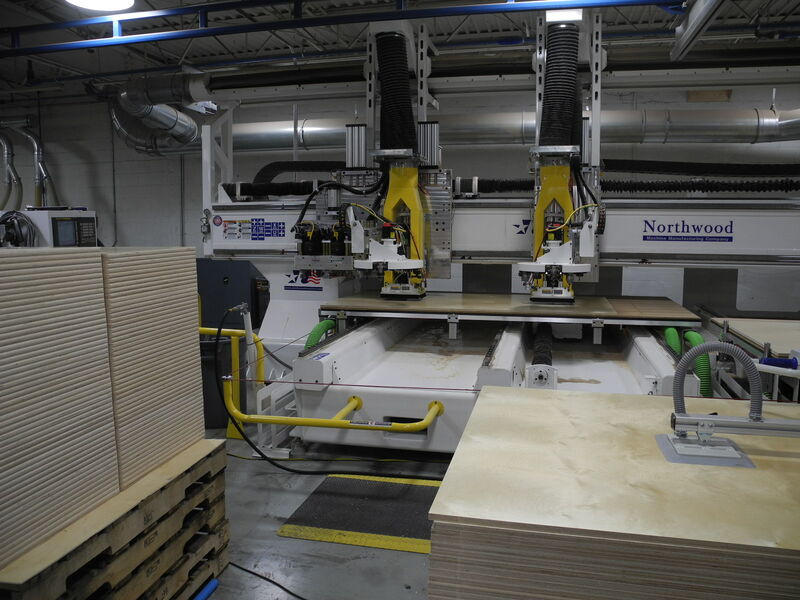 The Norwalk shop itself was laid out using AutoCAD to create the most efficient product flow. There are 38 to 45 employees in Norwalk. Shop space is 15,000 square feet, plus a 5,000-square foot mezzanine that is used for storage. "Machine suppliers tell us we're one of the leading companies in this area as far as technology goes," Chris says. "The technology lets us be competitive with our prices and still get the product out the door in a timely fashion." KBCAM has three people creating drawings in Cabinet Vision. Everything is backed up with a cutlist on a clipboard. Chris has been an important Cabinet Vision user for a decade (see accompanying story). Panel processing work goes from a Selco EB90 panel saw to a Biesse Rover 30 with a 5 x 14 bed that has been used for nine years. The company tries to use the Rover as much as possible. A Brandt edgebander is also used, and all face frame and door mouldings go through a Weinig Unimat moulder, then on to an Omga chop saw with TigerStop. KBCAM also has a Butfering Optimat 54 inch widebelt sander, Raimann gang rip saw, Panhans TYP335 jointer, Dodds SE-1 jointer and dedicated small shapers for cope and stick pieces. Transfer carts move work in process. The Norwalk shop also has a prep booth for priming and sealers, and a finish booth, which is the next area to be upgraded. KBCAM likes to make as much as they can themselves, but they do outsource three-dimensional 3D carvings, onlays and corbels, and Rev-A-Shelf organizers and plastic products. They're doing a lot of painted, beaded face frame with high quality hardware. Undermounts are Blumotion. We'll never know what Frank Lloyd Wright could have done with advanced design software, but he would have appreciated Kitchen & Bath for CAM's attention to detail.